Editor's note: Our two-part series honoring the Broken Spoke's 50th birthday begins with an essay from longtime music and culture writer John T. Davis. Below, Davis — who's called Austin home for more than three decades — recounts a few of his favorite, if hazy, nights spent under the influence of the Spoke. Happy Birthday, Broken Spoke. Fifty, going on timeless. The Lord loves a honky-tonk: dance in circles to the band (counter-clockwise, always); waitresses who call you “hon;” a selection of cold, non-ironic beer; whiskey for them that’s drinking to forget something. Pool and shuffleboard. Chicken-fried steak so good it’s been known to inspire the defection of Russian spies. The Spoke remains relentlessly unfashionable, even in the era of the unstoppable post-Uchi/craft cocktail/young ‘n’ urban gentrification of South Lamar. Even the Spoke’s South Lamar beer-slinging cousin, the Horseshoe Lounge, has been swamped by the Walking Hipsters (sharing a parking lot with Barley Swine didn’t help). Even for 1964 it was funky, the stuff of code inspectors’ nightmares. Joe Baland, a carpenter by trade, built the Spoke on the site of an old lumberyard, along with his son-in-law, James White and local businessman Jay Johnson. They basically just wanted their own place to drink beer, and they, along with a bunch of South Austin good ol’ boys pitching in sweat equity for cold beer, cobbled the place together. Even for 1964 it was funky, the stuff of code inspectors’ nightmares. Still, the place never fell down, even when a tour bus caved in part of the back wall several years back. White, who soon became the public face of the Spoke (along with his wife and daughters), came up with the name of the joint after an old Jimmy Stewart western called Broken Arrow. The dancehall portion was added onto the bar and restaurant later and it has hosted some of the greats: Bob Wills and His Texas Playboys (one of Wills’ half-smoked cigar butts still resides in the memorabilia-choked side room that White calls the Tourist Trap), Willie Nelson (in short hair and a spiffy turtleneck), Ernest Tubb, Kitty Wells, Ray Price and Roy Acuff. And, later, a second generation of Texas troubadours took the stage: Asleep At the Wheel, Jerry Jeff Walker, Bruce and Charlie Robison, and a San Marcos band called Ace In the Hole with a wet-behind-the-ears singer named George Strait. I don’t remember the first time I walked through the Spoke’s front door, but one enduring memory is of seeing Alvin Crow (who used to practically get his mail at the place) and Texas Playboys alumnus Jesse Ashlock hold a master’s class in Western Swing fiddling. That was probably in the mid-Seventies, when the hippies and the rednecks were gingerly feeling each other out, mixing Pearl Beer and ten-dollar lids of grass, and in the process conjuring up an enduring fusion of country, folk and rock ‘n’ roll that put Austin on the map. There have been a lot of my nights spent under the neon beer signs’ glow since then. Kris Kristofferson, Willie and Kimmie Rhodes wound up taking over the tiny stage one night, to the delight of myself and gob-smacked dancers. I heard about Jerry Jeff sitting in with Ernest Tubb one night. Loretta Lynn’s birthday was for years an occasion for the A-list of the town’s best country singers and songwriters (although never, alas, Loretta herself) to gather, sing and carouse. Big fun even if, like myself, you couldn’t dance a lick. Someday, I suppose, a team of anthropologists is going to swoop down, put the whole shebang under glass and cart it off to the Smithsonian for the edification of future generations who might not know how to dance backwards and in circles. 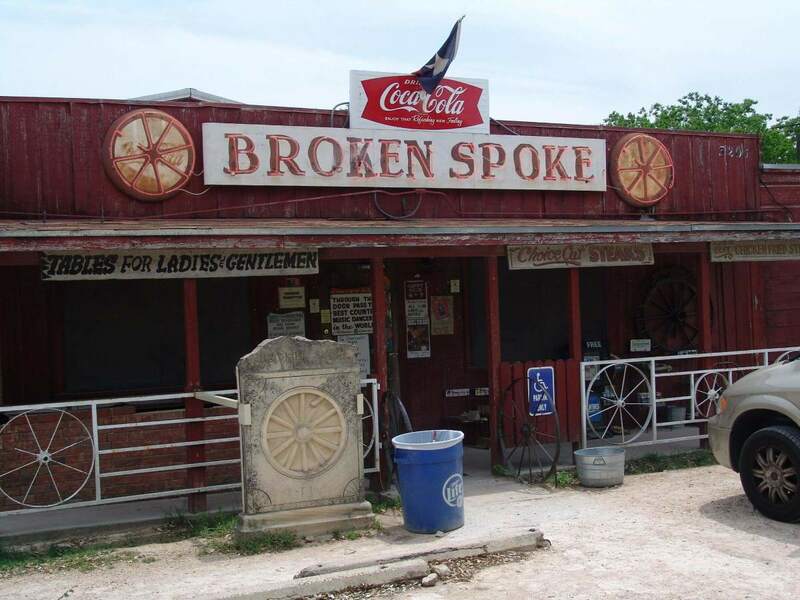 Until then, the Broken Spoke endures. Dip the girl at the end of the dance. Don’t forget to tip the waitress. And don’t forget to dance with who brung you.